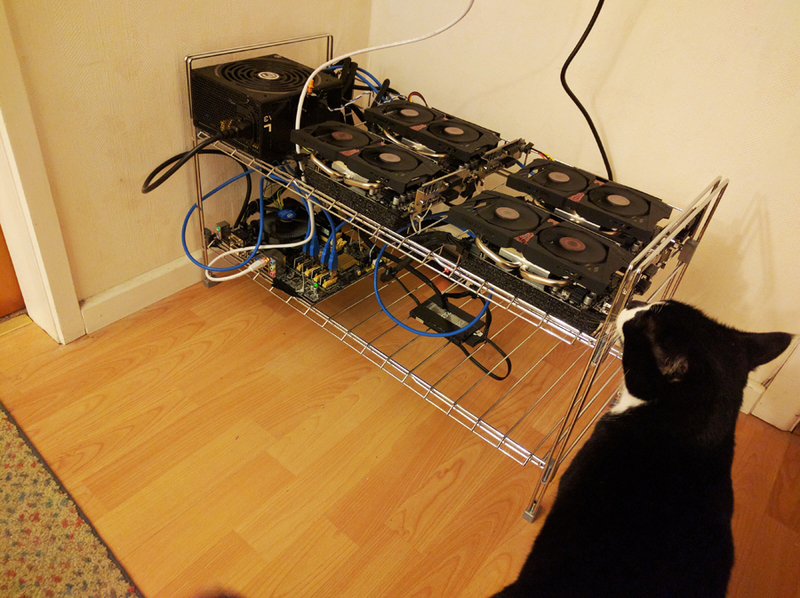 The mining rigs reveal the DIY engineering and amateur craft necessary to build a peer to peer, de-centralized computer network. Dovey collects the images from various online forums where hobbyists share pictures of their mining rig setups along with their instructions and technical specifications. The practice of re-purposing graphics cards, originally built for video gaming, into specialized mining computers has created a shortage and increased market demand for gaming hardware. The card game comments on the practice of re-purposing graphics cards, originally built for video gaming, into specialized mining computers; practice that created a shortage and increased market demand for gaming hardware. In the current protocol for mining crypto currencies on Ethereum, called proof of work, computers compete against one another to verify transactions made on the blockchain network and gain financial rewards for being the first to do so. By comparing each mining rigs attributes, individuals are encouraged to compete against one another, imitating the practice of computers competitively mining for profit on a blockchain network. Each card is digitally stored on a blockchain and contains a unique hash that can be used to identify limited editions of each card and turns the game of mining for profit into a crypto-collectable artwork.